Featured Project — Lehman & Lehman, Inc. If you've been to downtown Mishawaka, Indiana recently, you probably noticed quite a bit of buzz around the revitalized Central Park. There is a new energy in the air, children’s laughter and beautiful green spaces have now replaced what has historically been a place that many have avoided for years. The Mayor of Mishawaka, Dave Wood, described the former Central Park as being a place his grandparents forbid him to go when he was younger due to safety reasons. This past summer, the City of Mishawaka, along with Mayor Dave Wood, welcomed excited citizens for a community ribbon-cutting at the newly re-designed Central Park. Located in close proximity to the downtown and adjacent to the St. Joseph River and the Mishawaka RiverWalk, Central Park encompasses diverse activity areas including active athletics (tennis and basketball courts), three (3) play areas, a new splash pad with a programmable interactive and illuminated fountain, climbing tower, large open event lawn surrounded by a multipurpose walk, comfort station, and five (5) rental pavilions. This $5 million renovation was financed by Tax Incremental Funding (TIF) and is becoming an economic catalyst for the City and providing the citizens of Mishawaka with a community park, in which all would feel safe. In 2014 the City of Mishawaka commissioned Lehman & Lehman with a limited work scope to locate a new playground structure that had been purchased but was in storage for over a year. Through the planning process Lehman encouraged the City to consider a bigger planning picture that resulted in an overall site master plan. With the newly developed Hospice Center adjacent to Central Park a new vision had been cast for this important river front area. Lehman & Lehman was the lead consultant of a talented project team including DLZ and Lawson-Fisher Associates as the driving force for the revitalization of Central Park. Throughout the park design process consideration was made for connections, both physically and socially. While the RiverWalk connects the community, the amenities at Central Park were anticipated to bring the community together with features such as the pavilions – one of which has a four-sided fireplace – for family and company gatherings; the large open lawn area for passive recreation and fireworks viewing; and the interactive, illuminated fountain with water cannons (using re-circulated and filtered water), which is undoubtedly the most popular place in town on warm summer days! One of the more significant elements was the Central Park Playground. The design team at Lehman & Lehman knew that a playground of this magnitude had to be innovative and out of the norm. They chose to work with a company named KOMPAN, represented by Recreation inSites, LLC. KOMPAN is known for leading the world in innovation and providing equipment that is designed appropriately for each age group. 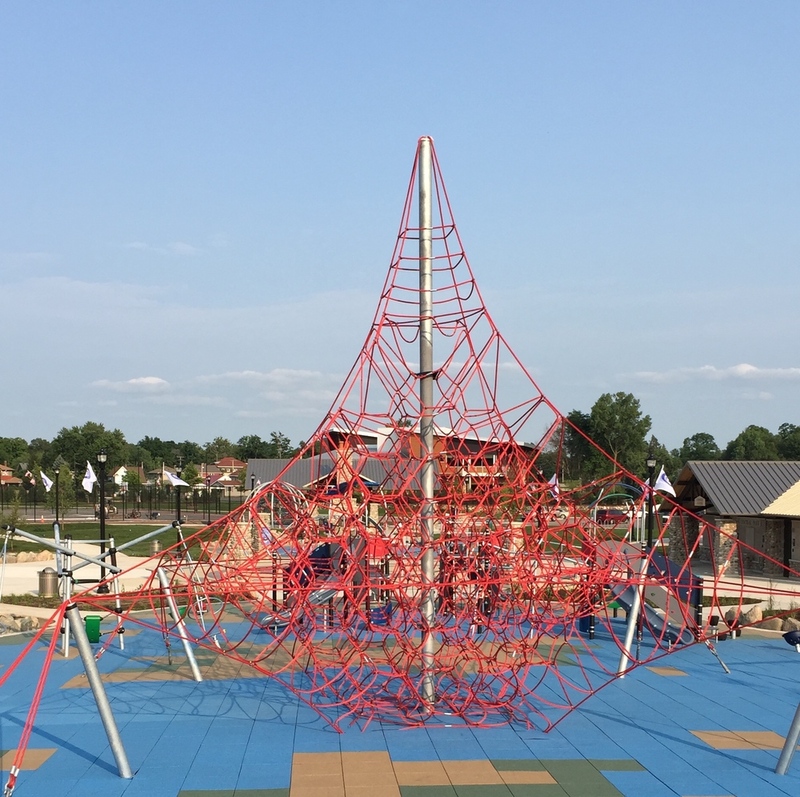 Improving the Quality of Life for the citizens of Mishawaka was a key planning value for the play areas where play equipment can be both challenging and beneficial in maintaining a healthy lifestyle. Lehman & Lehman, along with Recreation inSites, set a goal of providing a unique and challenging play space that allowed children of all ages to use their bodies in new ways, explore, innovate, and learn through play. As a result, various unique play structures were selected to challenge children in a number of ways. This playground is not the typical post and platform type of playground with just slides and swings but rather a playground that challenges children and adults to work on their agility, balance and coordination. With these weight-bearing activities, children will increase their muscle strength through pushing and pulling. Their core will be engaged and challenged. Children will work together, challenge themselves to be faster, improve their endurance, and strength. Children will naturally make up games that encourage positive competition and compromise. Through this type of play, children will learn to listen, share and problem solve while playing on the playground. Nearly all the components of the playground focus on a 360-degree play philosophy. Children can start playing at any area and then are able to dictate their pathway. Transparency is key to this playground as well. Almost all the equipment allows for parental visualization from nearly every area within the playground. With the use of playground tiles, an accessible route is provided throughout all the playground areas. Central Park’s playground features equipment like the Giant Octanet and the Crystal Sphere. Currently, this is the only playground in North America to feature both of these Corocord structures. With an overall height of 28 feet tall, the Giant Octanet is an impressive and inviting climbing structure (“tallest climbing tower this side of the Mississippi”). With its impressive stature, the Giant Octanet can be seen from across the RiverWalk, inviting people to come play. The large playground features the Cirque. The Cirque allows for meeting points that all children will find enjoyable and challenging play options. The accessible stairways comply with the guidelines of the Americans with Disabilities Act (ADA), providing access to elevated activities. This structure has exits close to the entry points — a clear advantage for wheelchair users. The Cirque supports traditional playground games such as “grounder” by ensuring that all activities are interconnected. Children can enjoy several of the spinning elements located on the main playground, ride the rails on the Miram that simulates being on a skateboard and enjoy slides, swings, and so much more. There is also a crawl tunnel along with traditional swings and slides, all on an accessible safety surface. In maintaining the historic style featured along the RiverWalk, the named pavilions (carrying the names of former industries of Mishawaka), the entry arch, and the comfort station feature cobbled stones and metal roofs that give a modern feeling of the historic Works Progress Administration projects of 70-plus years ago that still exist in certain places throughout the city. The comfort station has five family-sized bathrooms and houses all the computerized mechanical, electrical and plumbing components of the fountain and park lighting. For safety, the bathrooms are programmed to automatically lock at 10 p.m. daily, and for efficiency, have occupation sensors. The park connects Mishawaka Avenue on the north to the RiverWalk with almost half a mile of newly paved walkways. 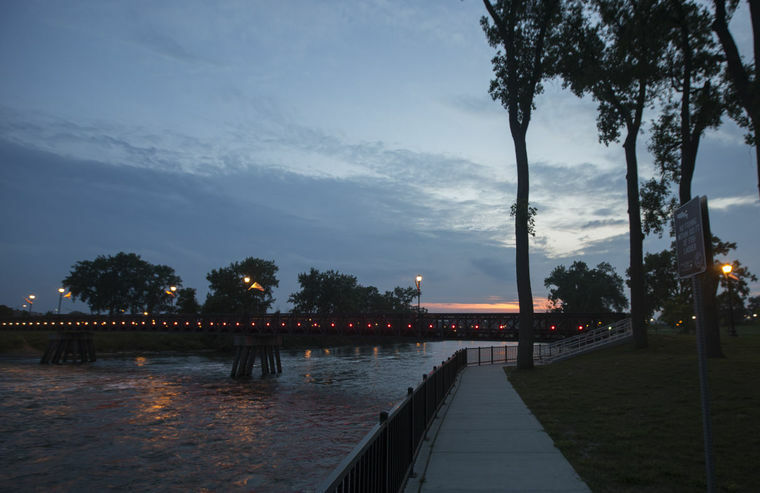 The existing pedestrian bridge over the St. Joseph River was highlighted as a part of this project with new LED lighting that has programming to change colors. This has become a new “art form” for the river. Along Mishawaka Avenue the center focus is a relocated statue of Christopher Columbus. Future plans include considerations for concession stand / food trucks, zip line, and skate park. 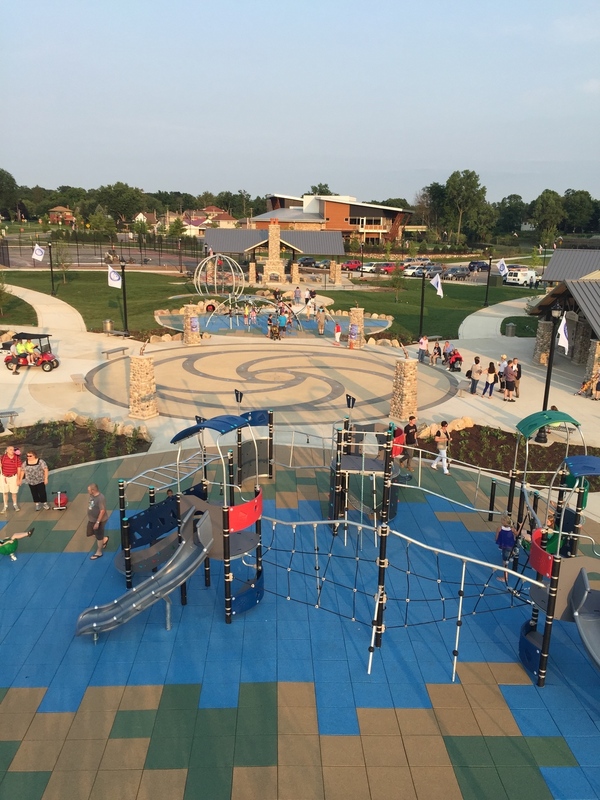 The composition of each of Central Park’s components enhances the park to create one the most unique play experiences in the state of Indiana. 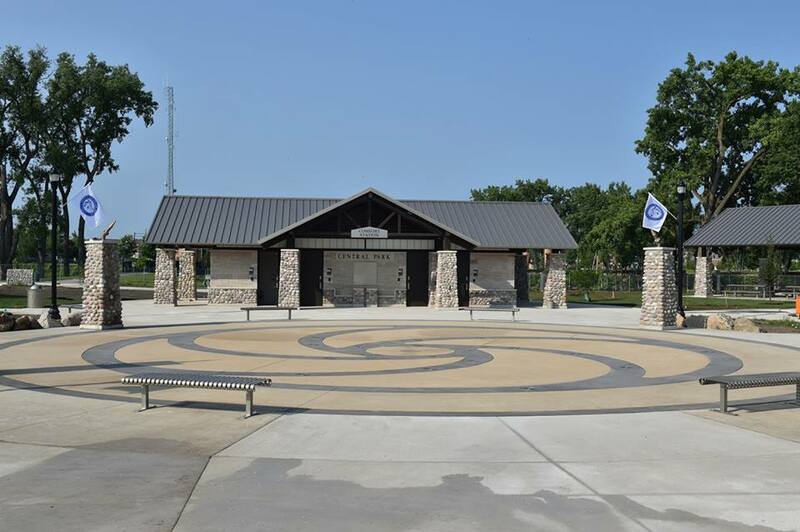 The revitalization of Central Park, its playground, shelters, activities and places have allowed this park to become a destination point for Mishawaka’s citizens and those of the surrounding communities. No longer a place to avoid, Central Park is now a place where great memories are made each day.